June is here and this month, we’re dangling some new “karrots”, more on this exciting new venture soon. Until then, we have another action-packed calendar of events and opportunities not to B-missed, in fact, take action and get involved. Marketing your brand through event sponsorships, at the grass roots level and through community engagement is at minimum a B+ solution, Buzz worthy and Budget friendly. We begin the month TODAY on Wednesday, June 1 celebrating the 22ndAnnual Ontario Wine Awards. The WineTario award winners will be unveiled at a special presentation in Niagara-on-the-Lake, celebrating the success of Ontario’s wine industry. Guests and honourees will be treated to a reception of local appetizers paired with a selection of the Gold Medal wines. A second consumer event will be held on June 16th, more info here. Addendum: Raise a glass to future event opportunities and connect with us ASAP to learn how. 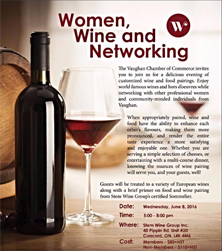 If marketing to women is your target, add another glass of wine to your to-do list and join the Vaughan Chamber of Commerce on Wednesday, June 8 at the Women, Wine and Networking event at Stem Wine Group. A delicious evening of customized wines and food pairings, paired with professional women in business and community-minded individuals. Register here. The UEFA Euro Cup officially gets underway on Friday, June 10th and continues to July 10th. 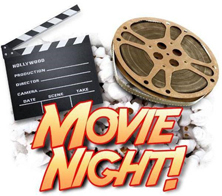 Although held in France, you can get in the game with all the fixings, big screen TV’s and prizes at one of the several AllStar Wings & Ribs GTA locations. Go ALL IN here. On Tuesday, June 14, if you’ve never attended any other networking event, this is the one to add to your schedule. Be amongst the 600+ anticipated attendees at one of York Region’s largest business networking events, the Colossal Chamber Networking Event at The Manor byPeterandPauls.com. Be an exhibitor or simply attend the event, register here. Sunday, June 19 is all about dad celebrating Father’s Day. The only place to B-seen is with your dad, so why not feed him and take him to Trio Restaurant at Novotel Toronto Vaughan Centre for the special Father’s Day Brunch. CLICK HERE for the menu and to make reservations. 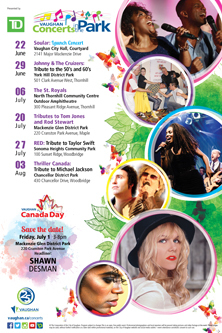 Plan B Promotions is delighted to once again partner with the City of Vaughan as Vaughan Celebrates Concerts in the Park, held every Wednesday evening beginning at 7:30pm featuring FREE professional concerts. June’s line-up includes: June 22: The high-energy party band Soular will launch the concert series at Vaughan City Hall’s outdoor courtyard at 2141 Major Mackenzie Drive and June 29: Johnny & The Cruizers with a tribute to the 50s and 60s at York Hill District Park in Thornhill. Be a part of the excitement, learn more here. We head to Mississauga next with notable congratulations to Il Porcellino Italian Restaurant & Catering as they celebrate their 20th Anniversary. 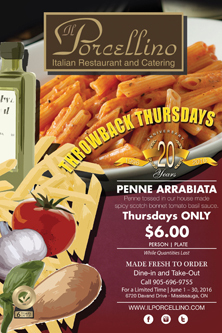 For the entire month of June, they’re throwing it back on Throwback Thursdays so you can enjoy their infamous ‘penne arrabiata’ pasta dish for only $6. We close off the month with Taste of Toronto, foodies unite from June 23 to June 26 at Fort York transformed into a tasty wonderland of summer eating, drinking and entertainment. The city’s latest, greatest and hottest restaurants will be dishing up their finest …a prelude to this fall’s 10thAnnual Edition of Savour York Region Restaurant Week, powered by Plan B Promotions. Last month, the City of Vaughan held its annual Mayor’s Gala at the Terrace Banquet Centre, where almost 1,000 guests were in attendance. This year’s theme, “Making Modern History” was inspired by the City’s 25th anniversary and it did just that – made history with a record breaking $2 million raised thanks to the many businesses, individuals and residents who generously donated to support the noble mission to change lives. As part of Vaughan’s commitment to support the development of healthcare services close to home, guests were invited to participate in a live auction to have dinner with Mayor Maurizio Bevilacqua and an opportunity to name a street in the Vaughan Healthcare Centre Precinct where the future Mackenzie Vaughan Hospital will be located. The successful bid came from Liberty Development at a record $400,000 which will go directly to the Mackenzie Vaughan Hospital. As the evening progressed, Greenpark Group of Companies pledged $1.2 million towards the Mackenzie Vaughan Hospital as well. The Mayor’s Gala – together with the Mayor Maurizio Bevilacqua Annual Charity Golf Classic – have raised more than $5 million since 2011. The annual event benefits more than 100 not-for-profit organizations that provide essential services in the City of Vaughan and beyond. Visit here and be inspired by the spirit of generosity. Need more info or interested in any of these events, we invite you to contact us and get involved to B-Scene. Please feel free to also share this email.